First-time visitors to Moscow shouldn't miss a walk down one of the capital's oldest streets. Artists, merchants, Pushkin, dogs and bears – occasionally the Arbat (sometimes called Old or Stary Arbat to distinguish it from Novy-“New”-Arbat) becomes a circus. For first time visitors to Moscow, it is one of the top places to see. What can you really expect? Let’s take a walk. Pick a sunny day to stroll down Arbat, since the most interesting things happen when the sun is out. 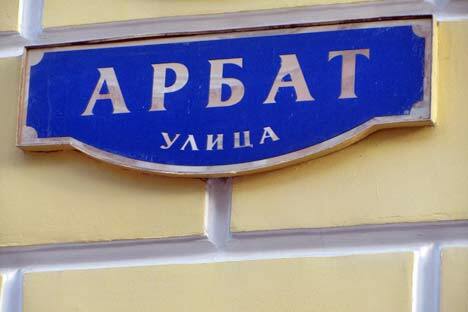 You enter the Arbat from metro station Arbatskaya, at the famous Restaurant Praga. During the Soviet era, it was nearly impossible to get a reservation there. Near the entrance of the street, the first portrait painters wait for patient subjects, who seek a more-or-less realistic image of themselves. In the near distance, you can hear rhythmic percussion, and a little further down the road, you will come across a large group of Hare Krishna followers. The easy lyrics of their songs make it easy for them to perform in every country and language. If you get the urgent desire during your Sunday afternoon walk to get a tattoo, keep your eyes open for the various people wandering around Arbat, promoting tattoo shops with their flyers. Women in traditional Russian or Ukrainian costumes, as well as people in bear and cow costumes, walk in bored circles, advertising souvenir shops – great photo-ops for the craziness-seeking tourist. Both sides of the Arbat feature coffee places and restaurants to relieve hungry walkers. While there are plenty of local cafes, famous international chains also appreciate the historic location and crowds. Subway, McDonalds, Starbucks and the Hard Rock Café can be found here. Further on, a group of students are having a pillow fight in the street, turning the Arbat into a snowstorm of fluffy feathers in the spring sun. A stray dog joins in, tearing apart the last bag of feathers with his teeth. Every few meters there is something to observe: mimes, musicians, pets (displayed in boxes or cages to be photographed or for sale), a flea market for old books (during every visit to the Arbat, my dear boyfriend finds a collection of classics he wants to buy, but changes his mind last minute and spares us a heavy load to carry home in the metro), the famous graffiti wall dedicated to Victor Zoi, founder of the Russian band KINO, or the Vakhtangov theater and the Turandot fountain. The Pushkin house in flashy blue is not to be missed (mainly because of its distinctive and penetrating color) and is overseen by a monument of Pushkin and his wife. The monument to Bulat Okudzhava in the middle of the Arbat competes for attention with a life-size plastic cow, advertising the restaurant “Mumu.” Strangely enough, visitors seem to find the cow much more amusing and photogenic. Exit Arbat via Smolenskaya metro station (there you can enjoy a beer in the quite nice John Bull Pub) or take a further walk, passing the foreign ministry building (one of the Seven Sisters, the Stalin Skycrapers) to Kievskaya, taking NOT the bridge where cars are crossing, but the beautiful enclosed pedestrian bridge. (This is also a nice way to cross the river in winter, as the bridge is closed and has benches inside - once there was even a photo exhibition organized there). The path on the riverbank to the bridge is elevated and gives a great view to the Kievsky Vokzal, Moscow City and the Evropeisky shopping. At Kievskaya you can jump on one of the boats leaving for trips on Moscow river, or take the good old metro.